Established for more than 35 years, Caché continues to offer a comprehensive line of French, Italian, and Portuguese reproduction furnishings as well as antiques and one-of-a kind accessories. Each piece is hand crafted and finished exclusively by local artisans. Caché offers custom sizes and finishes on their collection of fine reproductions. The Las Palmas Collection is the story of a designer who could not find the pieces he wanted for his own projects and wound creating a whole line of furniture for other designers. Designed by James Lumsden, Las Palmas is a unique collection of wood and iron furnishings that have a “found” look about them. Las Palmas features a wide selection of furniture from armoires to beds to occasional tables and everything in between, all with choices of a variety of finishes. 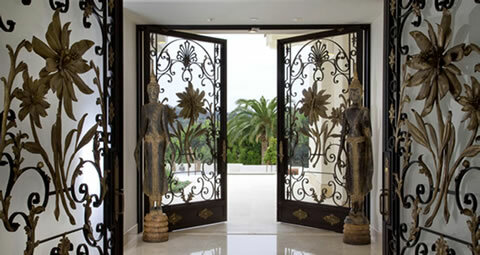 All workshops are in Los Angeles, so they can supervise the quality and, as important, provide the designer with custom applications and variations. Originating in Budapest, Hungary in the late 1800s, Naos Forge has been creating exquisite antique reproductions found in the United States and around the world. Featuring beautiful iron work in furnishings and lighting fixtures, Naos Forge has pushed the boundaries of blacksmithing to a new level which catapulted the company into a class by itself. The use of old world techniques, meticulous attention to detail and skilled craftsmen has been the key to Naos Forge’s success. Recognizing the importance of customization, any of the products can be customized by design and finish.